Additional amenities you will find in each of these condos in North Myrtle Beach, South Carolina include high-speed Internet access. There is a convenient washing machine and clothes dryer in these North Myrtle Beach vacation rentals, too. You can do laundry every day during your North Myrtle Beach vacation and never really interrupt your vacation. Televisions with DVD players, a microwave for making popcorn on movie night and more are provided for you in these non-smoking North Myrtle Beach condominiums. For a real treat, venture out to the open air balcony in your private North Myrtle Beach condo rental. The balcony is a wonderful place to sit and relax while admiring the views of the Atlantic Ocean. Feel the gentle sea breezes blow in off the ocean and listen for the sound of crashing waves as you just relax. 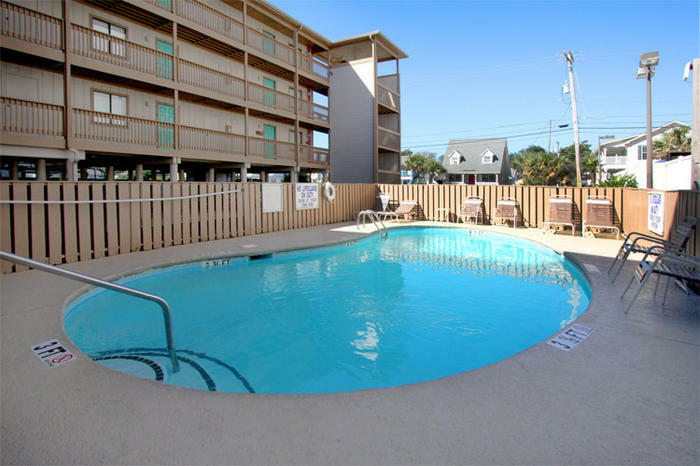 This is where you ideally let go of stress and start to enjoy a carefree North Myrtle Beach vacation at Crescent Villas. There is convenient parking as soon as you pull into Crescent Villas and stairs are located on either end of the L-shaped hallway. This mid-size North Myrtle Beach resort is built on stilts and has three floors of North Myrtle Beach condominiums. It is a relatively private setting that features a swimming pool. That’s right the kidney bean-shaped swimming pool is an inviting feature of this North Myrtle Beach resort. Situated adjacent to a charming courtyard that boasts picnic tables, chairs and grills, this swimming pool sparkles in the sunshine and welcomes all ages. The courtyard is a wonderful spot for a family barbecue. Throw some hamburgers and hot dogs on the grill while the kids swim in the nearby swimming pool. Then dine together on the oceanfront during your North Myrtle Beach vacation. Not every North Myrtle Beach resort has an area as nice as this that encourages backyard barbecues at the beach! Getting to the beachfront from the comfort of your North Myrtle Beach condo rental at Crescent Villas is quite easy. Whether you want to walk down to the white sandy beaches first thing in the morning so as to catch an oceanfront sunrise or if you are taking the kids down to the water for a day of swimming in the surf, the beach access is readily available for guests of this North Myrtle Beach resort. Take a picnic to the beach or play games in the sand. Be sure to build at least one sand castle during your North Myrtle Beach vacation so you can show the folks back home. Comb the beach for seashells and shuffle your feet on the sand bar at low tide in search of sand dollars. The treasures you can pluck from the sea during your North Myrtle Beach vacation are memorable. In close proximity to this North Myrtle Beach resort on the oceanfront is a myriad of North Myrtle Beach amusements and Myrtle Beach area attractions. On the oceanfront you can find fishing piers with restaurants and arcades. There are boat tours, fishing charters, kayak rentals and Sea Doo rides for those who love the water and always want to be near it. Shopping is just around the corner from Crescent Villas. There is the Myrtle Beach Mall that features Bass Pro Shops and across the street from that is one of the two locations for Tanger Outlet Center. Barefoot Landing is filled with shops and restaurants and entertainment and is a great day-long destination for families. Broadway at the Beach is popular for its shopping and dining opportunities as well as its nightlife where Celebrity Square features several nightclubs in one convenient location. Live entertainment theatres are scattered throughout the Myrtle Beach and North Myrtle Beach areas. You may choose to see a rockin’ and rollin’ show at the Alabama Theatre or go for another musical variety show at Carolina Opry. Pirates Voyage and Medieval Times are both dinner theatres in Myrtle Beach, South Carolina and Legends in Concert is a tribute show that brings your favorite artists to the stage. In addition to hitting the shows around town during your North Myrtle Beach vacation at Crescent Villas you might want to hit the driving range and golf courses, too. There are more than 100 Myrtle Beach area golf courses and they are beautiful. Bring your golf clubs and make at least one tee time for your North Myrtle Beach vacation and bask in the sun while playing 18 holes. Elliott Beach Rentals is not affiliated with onsite management or the HOA of Crescent Villas.